WASHINGTON -- The red-hot Golf lineup drove Volkswagen of America to its second-straight monthly U.S. sales gain in June. Volkswagen said today it sold 30,436 vehicles last month, up 5.6 percent from June 2014. Sales of the five models comprising the VW’s Golf compact-car family totaled 6,145, more than double June 2014 deliveries. Diesel models also proved popular, accounting for nearly a quarter of VW sales. The mainstream Golf hatchback, the sporty GTI and the new Golf SportWagen all chipped in more than 1,800 units each. The Jetta compact sedan and Tiguan compact crossover also posted gains, while every other nameplate in Volkswagen’s lineup logged lower sales compared with June 2014. “We continue to see strong results from the Golf family, delivering the best June in 15 years. Diesel also proved its strength this month with more than 24 percent of our sales,” Mark McNabb, COO of Volkswagen of America, said in a statement. The momentum is welcome news for VW, whose car-heavy U.S. lineup has held it back in a red-hot crossover and light-truck market. Through six month, Volkswagen’s U.S. sales were down 2.6 percent to 174,442. Audi, meanwhile, said today it continued its hot streak on strong demand for SUVs and compact luxury vehicles. 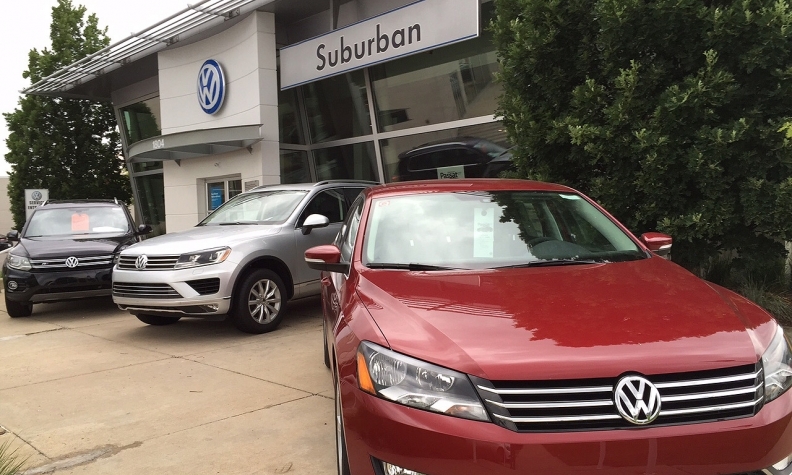 U.S. sales at VW’s luxury sibling grew 8.3 percent last month to 18,262 vehicles. It was its 54th-consecutive monthly sales record and the third-best month overall in Audi of America’s history, Audi said in a statement. Audi’s SUV sales grew 24 percent last month as the Q5, Audi’s volume-leader, gained 6.1 percent while the new Q3 subcompact added 867 incremental sales. The A3 compact car lineup also continued to see strong demand with sales of 3,482, up 42 percent from June 2014. The A3 is the second-best selling nameplate in Audi’s lineup. Audi’s sales were up 9.3 percent through the first half of 2015 to 23,861.